With the arrival of the Macintosh Pro Cylinder and it's addition to the high-end Retina MacBook Pro, Apple began shipping the first computer systems with ThunderBolt 2 ports. With additional revisions to the Macintosh desktop and MacBook Air and Pro, we saw the adoption of ThunderBolt 2 progress across their entire computer lineup. A large number of 20Gbps ThunderBolt 2 storage products are now available - although the vast majority are hard disk HDD and not SSD based. 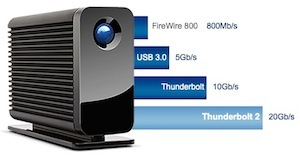 Those looking for a true, off the shelf 20G ThunderBolt 2 SSD don't have to wait any longer. LaCie shipped it's next generation of dual-drive ThunderBolt 2 SSD RAID with a current street price around $1300 USD. Its easily recognized by it's dark charcoal aluminum enclosure case to visually distinguish it from it's 1st Generation silver aluminum 10G ThunderBolt Little Big Disk SSD predecessor. LaCie's benchmarks of this PCIe based SSD RAID is peaking around 1400-1200 MB/sec Read and Write speeds. Click above to see technical specs and current pricing on the blazingly fast and state of the art solid-state 20G ThunderBolt 2 external RAID drive from LaCie. Of Note: The ThunderBolt 2 LaCie SSD has first to switch from 2.5" SATA III solid-state drives used in earlier models to a pair of 512GB PCIe SSD modules for even faster performance in the 2nd-generation of it's external ThunderBolt RAID storage solution. LaCie's hybrid D2 ThunderBolt 2 external drive is an interesting innovation. The base drive ships with a high-speed 7200RPM hard disk for reasonable USB3.0 and TBolt performance in the 200+Mbps range. However you can OPTIONALLY replace the drive's backplane with a slide-in 128GB solid-state PCIe SSD module and controller board to get Read/Write speeds well over 1000+Mpbs. This sort of Fusion / Hybrid drive comes at a stiff price, and replacing the Combo inferface card for an SSD also removes the USB 3.0 port and makes it a daisy-chainable dual-ThunderBolt 2 drive only. That said, it offers the prospect of both high-speed AND high-capacity storage. The first ThunderBolt 2 hard drive with conventional spinning platter mechanisms came from Promise. The next-generation Promise Technologies Pegasus2 line was announced and shipped the day the cylindrical Mac Pro was released. Although based on HDD mechanisms, when 4-6-8 hard drives are configured in a striped RAID 0 array, they rival SSD technology for mind-blowing Read/Write performance - at a much lower cost per GB. If you remember historically at the dawn of the TBolt era, Promise delivered the first ever ThunderBolt-ANYTHING with it's 4, 6, and 8 hard drive RAID arrays. For nearly a year it was the ONLY SHIPPING ThunderBolt storage product and with starting prices well over $1400 USD it was geared only for pro video and audio editing or enterprise markets. The second external ThunderBolt SSD drive to reach the market was a compact, solid-state dual-drive RAID SSD array from LaCie priced well under $1000. Initially it used 2-128GB Intel SSD's on a 3GBps SATA II controller. In the years since, LaCie has upped the capacity, brought prices down and revised it to support much faster 6GBps SATA III 2.5" drive modules. So it seems history had repeated itself. Promise once again was first out of the gate with a ThunderBolt 2 hard disk RAID solution shipping along with the new Mac Pro - and LaCie close on it's heels and poised to deliver a more affordable ThunderBolt 2 SSD RAID solution.